We are a nation of tired women. People may ask you, “why are you always so tired?” Many of us struggle with fatigue, trying to find the stamina we need to keep up with busy schedules. We juggle family, home, jobs, and other responsibilities, and never seem to have the energy we need. While we typically require seven to nine hours of sleep each night for optimal health and energy, a poll done by the National Sleep Foundation (NSF) found that the average woman aged 30-60 sleeps only six hours and forty-one minutes on weeknights. Another NSF poll of adult men and women found that women are also more likely to experience daytime sleepiness compared to men. And when you add in sleep-disrupting hormonal changes such as pregnancy, menstrual periods, and menopause, it’s clear that it’s difficult for many women to get enough sleep, and even then, the sleep we’re getting may not be “quality” sleep. If you’re feeling exhausted, tired, or lacking in energy, one of the first and most obvious steps you need to take is to ensure that you are getting the much-needed seven to nine hours each night. You may feel like sleeping a full seven hours or more is a luxury of time that you can’t afford. Health-wise, however, you can’t afford not to get enough sleep. Because, in addition to fatigue, lack of sufficient quality sleep affects thinking, memory, and concentration. It can also increases the risk of a number of other health conditions, including weight gain, hormone deficiency, muscle pain, and susceptibility to disease. You also need to make sure you’re getting good quality sleep. If you are experiencing frequent waking, restlessness, or you’re waking tired and unrefreshed after even eight or nine hours, you’re most likely not getting quality sleep. In particular, you probably aren’t getting enough stage 4 delta sleep, the deep sleep that is restorative to both energy and the immune system, during which the body recovers energy and repairs muscle tissue. The first step in getting quality sleep? Learn about various techniques — from stress reduction, to sleep hygiene, to guided visualization — that can help you achieve restorative sleep, and talk to your practitioner about whether or not herbal supplements or prescription drugs may help you obtain better sleep. If you are getting eight to nine hours of sleep each night, and still experiencing fatigue, you should see your doctor for a thorough physical evaluation. One factor your doctor should pay particular attention to is your iron level. Low iron — known as anemia — can cause fatigue in some women. Your doctor should also evaluate your reproductive hormones; imbalances in estrogen, progesterone and testosterone can contribute to fatigue. Perhaps most importantly, a thorough thyroid evaluation should be conducted. Fatigue is very often a symptom of an undiagnosed underactive thyroid — known as hypothyroidism. 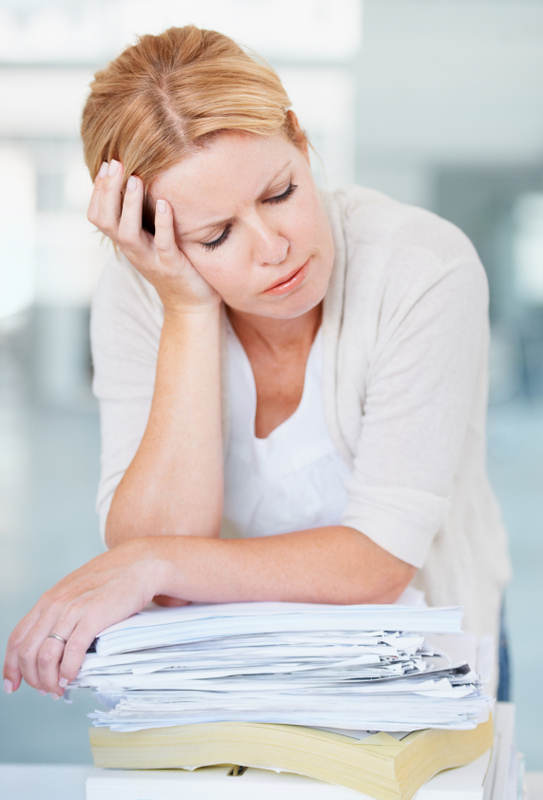 The fatigue can be mild, or it can be debilitating. Some thyroid patients describe fatigue so profound that they have to leave their job at lunchtime to take a nap in the car, just to get through the day. Others have reported needing as much as 14 or more hours of sleep per night on the weekend in order to survive the work week. Do not accept a TSH thyroid blood test result alone to rule out a thyroid condition. A knowledgeable practitioner should also include Free T4 and Free T3, as well as thyroid antibodies tests. In addition, tests may be part of the diagnostic process, but your symptoms and a clinical examination are essential as well. In particular, your doctor should look for unique thyroid clinical signs such as slow reflexes, goiter, and/or loss of the outer edge of your eyebrows. Even if you were already diagnosed and are being treated for hypothyroidism, you may still experience fatigue and exhaustion. In a 2002 survey I conducted of more than 1000 thyroid patients, almost 92% of respondents surveyed reported feeling fatigued and more exhausted than normal. This fatigue, alone, or along with other symptoms of hypothyroidism, can be a sign that your hypothyroidism is still not properly treated. You want to make sure that you are taking the proper dosage of the thyroid hormone replacement drug that is best for you. (For an overview, ). For example, some thyroid patients find that their fatigue is greatly reduced with the addition of T3 to their regimen, or a switch from synthetic to natural thyroid drugs. Feeling tired may seem like something we have to accept as a normal part of life, but it’s not normal. If unresolved health problems like thyroid disease are sapping your energy, getting the right evaluation, diagnosis and treatment can mean renewed vitality!